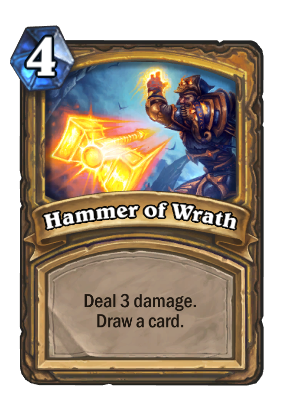 So priests and warlocks get a 1 mana draw spell ( Mortal Coil, Power Word: Shield, but we get a 4 mana, 3 damage+ draw 1 card. Should have been either 3 mana, or 4 damage. Except this can not only target face but is guaranteed to also draw a card. Still, it is a little underpowered at 4. I would totally play it if it was 3 mana. Does anyone else think this card is too expensive and therefore slow ? I think if you can afford to pay 4 mana for 3 damage, you're probably already winning/ahead. Hands down, coolest gold card. If you notice the character in the artwork is wearing tier 10 paladin set...could also be a hommage to Tirion Fordrings character model in Wotlk 3.3.5.